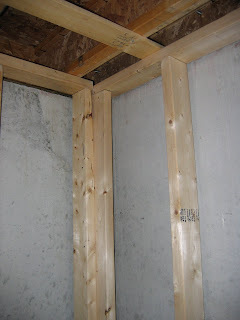 The critical trick to framing when you intend to use spray foam as the barrier between the wood and the concrete wall is to create a gap between the wall and the framed wall. We use at least a 1/2 inch gap but his would increase in areas where the concrete wall was perhaps not as plum as we would have hoped. Why not put the spray foam first, and then frame the wall? We would like to seal all the gaps behind the wall studs, and any awkward spaces your framing causes at the corners - you can only do this if the wall is in place.